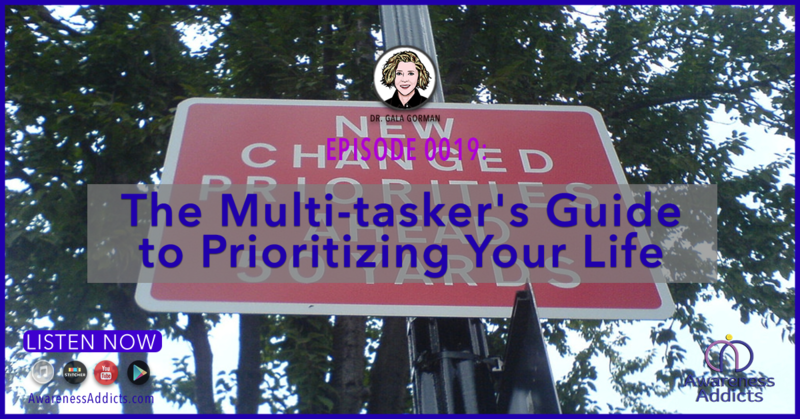 In this new episode of Awareness Addicts, the show’s host, Dr. Gala Gorman, discusses how to handle it when too many priorities and trying to multi-task become overwhelming. When making a necessary change feels overwhelming, setting priorities can help minimize the excess stress and make space for change. Which efforts deserve the most attention and focus? In this episode of Awareness Addicts, the show’s host discusses setting priorities to free up resources to make desired changes. Tackling too much can lead to overwhelm. Making the most important thing a priority can lighten the load. In this episode of Awareness Addicts, we discuss how to prioritize the important things to make room for necessary changes. As you consider making changes in your life, you may have wondered, “How am I going to fit that in?” You’re already juggling too much. Something will have to go. We have to choose our battles. Which efforts will be most beneficial? There is a key that we can use to help us sort this out. We’re going to apply the Pareto Principle as we consider the changes we want to make. We need to identify the actions to take so that we can re-prioritize our life for big results. To learn more about the show’s history, Read The Launch Press Release HERE.